Ignore the lack of a pelmet box in that photo. It's still there, I just didn't take a shot from this angle after I put it up! I've narrowed my runner choices down to the following ones but am always open to suggestions! 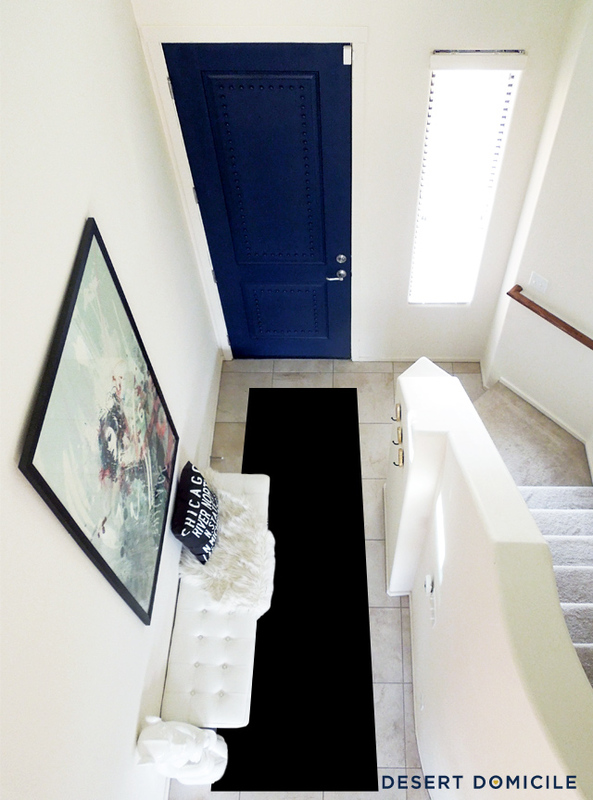 Ideally I'd like something that's darker or has a busy pattern just to help hide dirt since our entryway is a high traffic area and the rug probably won't be getting cleaned on a weekly basis. I do like the lighter options I've shown though and if they clean up pretty well, they could work too! Dark color? Check. Simple pattern? Check. I have the 5' x 7' version of this rug in army green and it is a bit scratchy underfoot but its held up well to my dogs claws so it should work in the entryway. 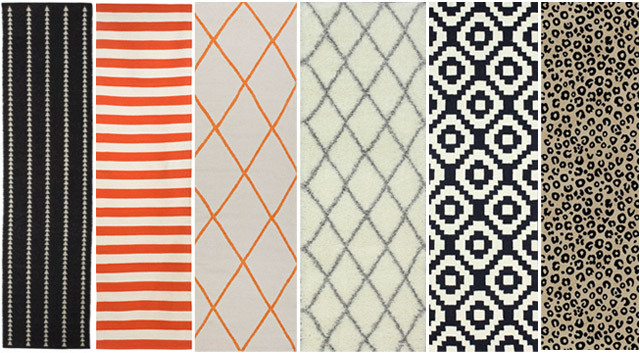 And the persimmon Draper Stripe runner is a pretty good match! There's also some orange in our artwork so it'd coordinate with it as well. This runner would also bring our front door color inside. The geometric pattern is simple but sweet and doesn't compete too much with the abstract floral fabric on our pelmet box. 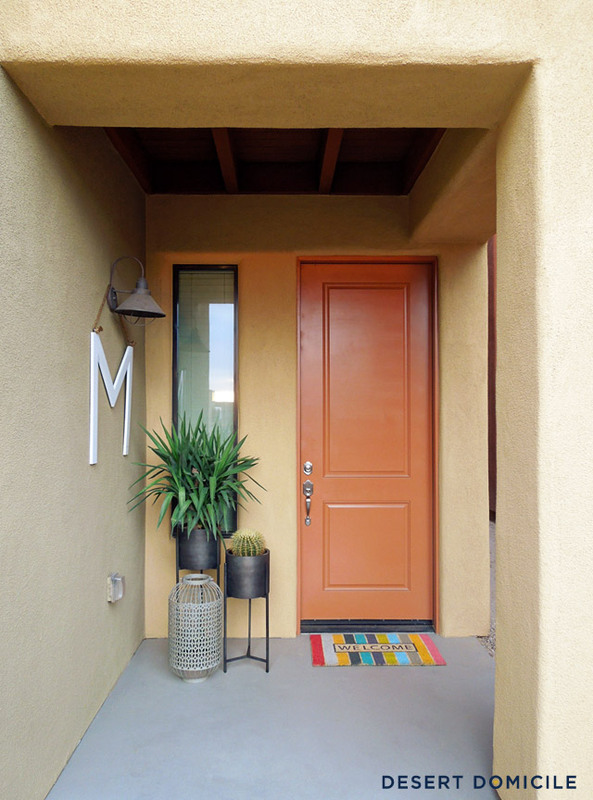 A shag runner is probably the last thing I should consider for our entryway but I love the look of this Moroccan runner! The color and pattern are nice and since the rug is a shag rug, it'd be really soft underfoot. The pattern of this pixel runner reminds me of Schumacher's Ziggurat fabric which is one I mentally considered for our pelmet box. The runner is a little more than a yard of the fabric so it'd be the cheapest way to bring the pattern into our foyer! This leopard runner is definitely the curve ball of the bunch but I really like it! It's a little funky and unexpected but it'd add a lot of personality to our foyer! Which runner do you like? OMG, I guess nobody is voting what I did again. But before I even saw your options I thought leopard and that's what I went with but I guess nobody shares that opinion ;) Second would be #2 and nobody shares that opinion either, ha!! Haha too funny! I really love the leopard one as well as the striped one. It's going to be tough to decide! You are THE worst influence. I must have that arrow rug for my kitchen. i actually chose the geometric one (3). i like number 5 but i didn't feel like it was right. 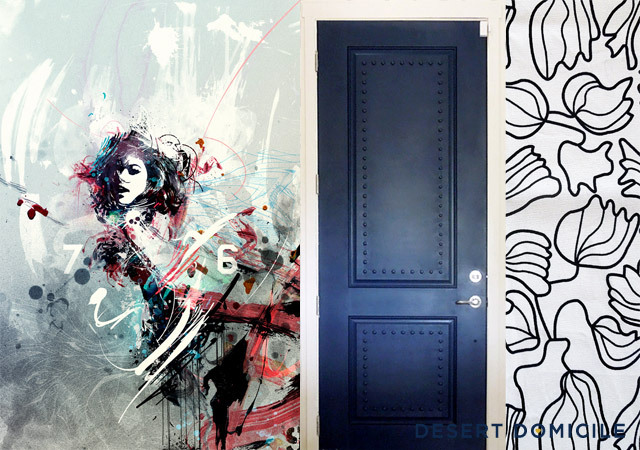 The Nate one is really great and would look awesome in your entryway! I have a tendency to do the same thing! We'll see what happens this time around! Leopard leopard leopard! All the way!!!!!! I like #5, but I also need to add a caveat - We had an awesome runner in our back entry that was red and white and it was HORRIBLE. It had white in it and ALWAYS looked dirty, no matter what I do. So for that reason, I would encourage finding something that maybe has less (or no) white. I'm not sure if you get lots of foot traffic there, but if you do, mine is a cautionary tale. That's a good point! We don't wear shoes in the house but a lighter runner could definitely get dirty from bare feet and our dogs paws. Do you think Scotch Guarding it would help at all? Those are all good choices. I would go with one of the darker ones, because you're going to get a lot of foot traffic on it. The light ones might get really dirty really fast. I'm excited to see what you choose! I love them all... but the stripe is my fav! Also loving that color on the door! I like 1, 4 & 5. I voted for 5 because I think I like that one the most. I don't think you can go wrong with those 3. In fact I'm pretty confident you can make any of the rugs work! I usually am able to pick something rather quickly but I'm stuck here. I love them all! And I laughed at "done." My husband is just starting to grasp the concept that I am never done.